Last week (early March 2016) we had a call from a lady. Let’s call her Nancy. Nancy called to say that her husband wanted to see us. Is her husband having any problem? Her daughter explained that was the one having problems and her mother wanted to come and see us with her husband. Okay come to the centre now if you like, was our answer. Nancy was 54-years old when she was diagnosed with with Grade 2, infiltrating ductal carcinoma of the right breast in May 2002. After a lumpectomy, her doctor recommended a total mastectomy – just to be safe! The pathology report indicated no residual malignancy or lymph node metastasis. No chemotherapy or radiotherapy was indicated but the doctor wanted to put her on tamoxifen (for five years!). Nancy and her husband were fully aware of the side-effects of tamoxifen and declined to take the drug. But her doctor told her: You have only one in a million chance of getting cervical cancer! Nancy responded: That one could be me! Nancy’s is a case of once bitten twice shy. Two years prior to her diagnosis, at the onset of her menopause, she was on hormone replacement therapy (HRT). She was well aware of the risk of breast cancer while on HRT. Her doctor checked and monitored her breast health every month to ensure that everything was under control. But it was not to be. Two years on HRT, cancer reared its ugly head in her right breast. Nancy came to seek our help in May 2002 and was started on CA Care Therapy. Nancy was in excellent health since then. But after 5 years we never get to see her again. 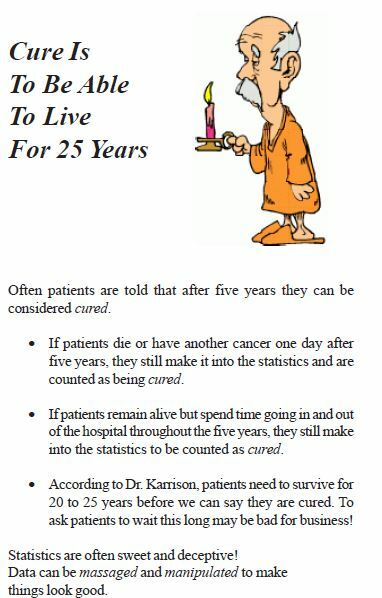 After all Nancy learned from her doctor and friends that if you survive 5 years then you can be considered cured. You will now learn from this story that you-are-cured-after-five-years-doctrine is an illusion, faulty and without basis. There are lobulated mass lesion in the right breast 4 x 6 cm invading the pectoralis muscle and underlying chest well. Multiple nodules seen in both lungs 5 to 15 mm. Multiple enlarged right axillary lymph nodes seen. Multiple enlarge mediastinal lymph nodes seen. L2 compression fracture with spinal canal stenosis. Multiple lytic bone lesons seen involving the sprine, sternum, ribs, pubic bones and left iliac crest. Immunohistochemistry stains profile supports the diagnosis of high grade metastatic adenocarcinoma from the breast. I was in despair not knowing what to say or feel. It was a frustrating morning indeed. It is hard to see apparently “successful” case turning rotten. 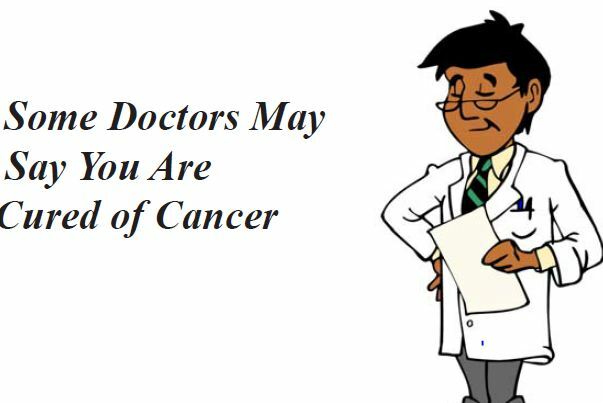 Over the years we have warned our patients that there is no cure for cancer. One day if you do something “wrong”, the cancer will come back again. If you are well, continue to do what you are doing and don’t let go. For most people it is hard. They want to go back to their old lifestyle, they want to eat what they like again, they don’t want to take the herbs any more — in short, they just want to do whatever they like, believing in this faulty idea that the cancer is gone forever after surviving 5 years. My aunty had cervical cancer. She survived 13 years and then started to cough for 2 years without anyone at home suspecting that something had gone wrong! Most tragic of all. there was a doctor living in the house! A CT scan showed the cancer had spread extensively to both her lungs. It was too late. After 8 months on herbs, one morning aunty died peacefully without any pain. Over the years, we have seen such tragedies being repeated over and over again. But not many people want to learn. Everyone wants to believe what their doctors tell them —You are cured after 5 years! This is another story: Breast Cancer: When a so-called “cure” was not a cure. MT had breast cancer in 2005 and underwent a mastectomy followed by 6 cycles of chemotherapy and 30 radiation treatments. Then she was prescribed Tamoxifen, which she took for 5 years. MT was told by her doctor that her breast cancer was at an early stage and that she had a 90 percent chance of complete cure with the treatments that she had undergone. MT believed her doctor and did exactly as what she was told to do. Each year she came back to her doctor in Melaka for routine checkup. At every visit she was told that she was fine. After 5 years, MT was told to stop Tamoxifen because she was already cured. Barely a year later, in April 2011, MT started to have pains in her tail bone and shoulder blade. She ignored the problem and did not go back to see her doctor. Then she started to take “jamu” (Indonesian herbal). The pains did not go away but rather became more intense. Then her legs started to hurt as well. She became breathless and was unable to walk far. In February 2012, MT returned to her doctor in Melaka. Examination indicated her cancer had recurred. MT asked her doctor why the cancer recurred when she was told earlier that she had been cured. The doctor replied, I do not know why. But don’t blame yourself. It is your fate. Also the recurrence has nothing to do with what you eat. It is just your fate. Yes, when modern medicine failed, God gets the blame! Looking at things from a positive angle, at least Nancy was already lucky or blessed. Her cancer recurred only after 14 years. 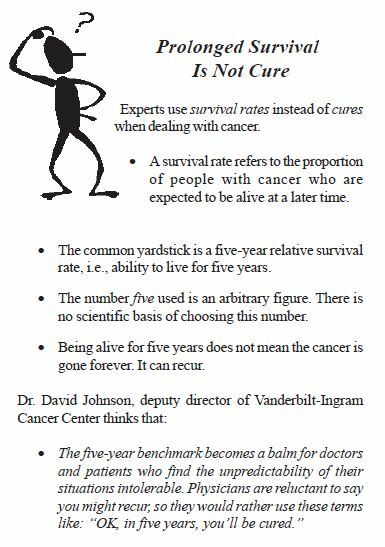 Many people even died 3 to 4 years after undergoing all the medical treatments of their cancer. Nancy had radiation to her backbone and this helped ease the pains. She was told to undergo chemotherapy but she refused, prefering to take herbs again. We are out front with Nancy — we can only do our best to help her live a pain-free happy life but we cannot cure her. We urged her to seek medical help if necessary (whatever that means). Let me ask you to ponder what I wrote earlier in Understanding Cancer War and Cure. This entry was posted in Breast Cancer and tagged breast cancer, recurrence by CA Care. Bookmark the permalink.